Enjoy the benefits of essential oils! 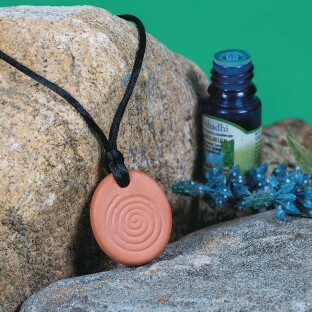 Enjoy all the amazing benefits of essential oils with this beautiful terra cotta pendant accented with a gender neutral, calming swirl design and an adjustable black cord. The necklace features a 1-1/4”W x 1-1/2”H x 1/4”D terra cotta pendant designed specifically to absorb and dispense your favorite scent. Simply place a drop of your favorite oil (sold separately) onto the porous pendant for the perfect balance of beauty and wellness. Necklace cord is adjustable to 30”L.